Good God: Karl Lagerfeld claims his very fashionable feline Choupette made no less than €3 million last year. 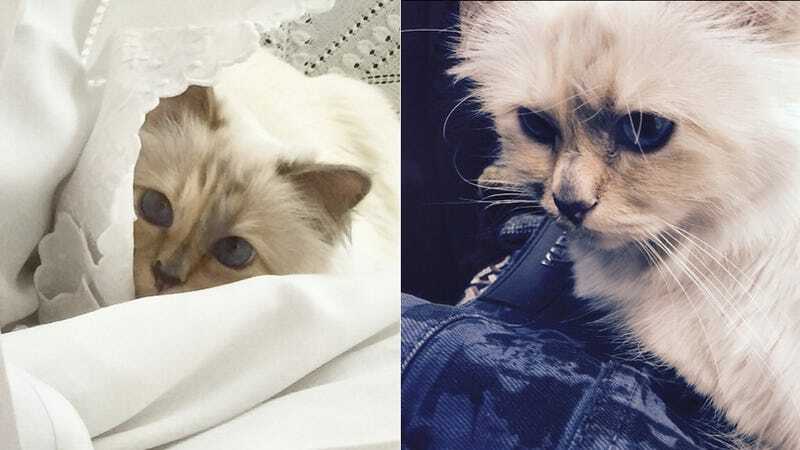 Again, Choupette is a cat. She did two jobs and made 3 million euros last year. One was for cars in Germany and the other was for a Japanese beauty product. I don’t allow her to do foodstuffs and things like this. She’s too sophisticated for that. She had something unique. She is like a human being, but the good thing is that she’s silent. You don’t have to discuss it. She hates other animals and she hates children. He goes on to compare her to Greta Garbo. It’s a miracle in the story. Choupette was not even given to me. Choupette belonged to a friend of mine who asked if my maid could take care of her for two weeks when he was away. When he came back, he was told that Choupette would not return to him. He got another cat who became fat, and Choupette became the most famous cat in the world, and the richest. So basically Karl Lagerfeld stole his friend’s cat and now he’s running around calling his friend’s new cat a furry lil fatty. The nerve, Karl, the nerve.